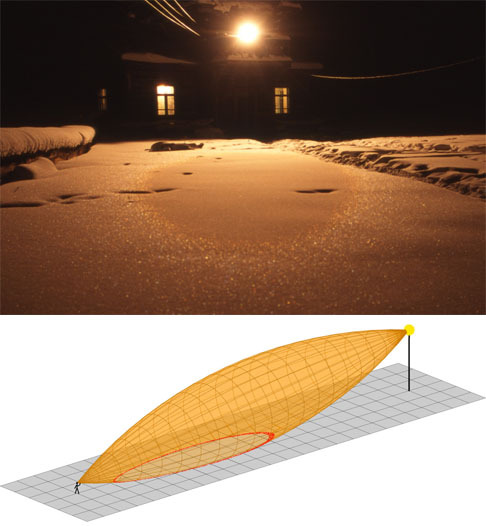 The photo here shows divergent light 22° halo on snow surface in Eastern Siberia in January 1996. In airborne crystals divergent light 22° halo is a cigar-shaped surface, sometimes known as Minnaert's cigar, while on snow surface a slice of this cigar is seen. The illustration - made by Walt Tape - shows how the effect is formed. Lamp is on the right, observer on the left and in between is the cigar shaped 22° halo. The gray plane is snow surface and the red circle is the 22° halo on it. More images and illustrations are on my web site ( 1 ). This is a nice effect. I saw this once during my military service, but didn't have time to stay around and appreciate it. That's a great, classic observation. 3D-Moilanen really knows his way around this stuff. I am amazed how good the photo where the 22 halo is the largest matches with Walt's observer's view diagram. It looks like the halo bents slightly downwards halfway towards the observer and same happens in the photo.